Terminal C has the most reliably open Precheck and Premier Access security lanes. Consider checking in and clearing security in at Terminal C even if departing from another terminal. 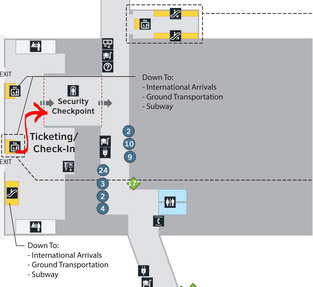 There are no UA check-in counters in Terminal A, even though UA has a few flights that depart from Terminal A. 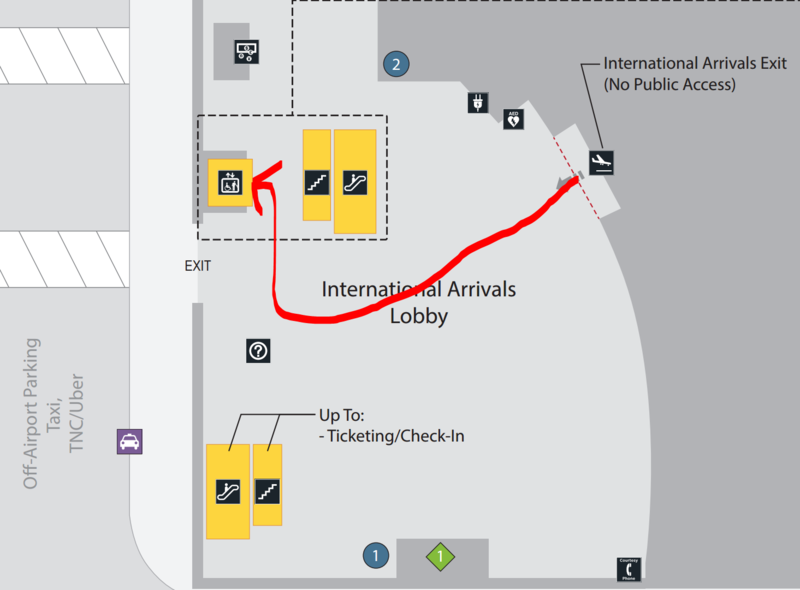 Check in at Terminal B or C.
Note that the higher-numbered C gates (C29-C45, aka "C South") are directly connected to the E terminal by a walkway. It is usually faster to walk from C South to E (especially the low E gates) than it is to take the train. 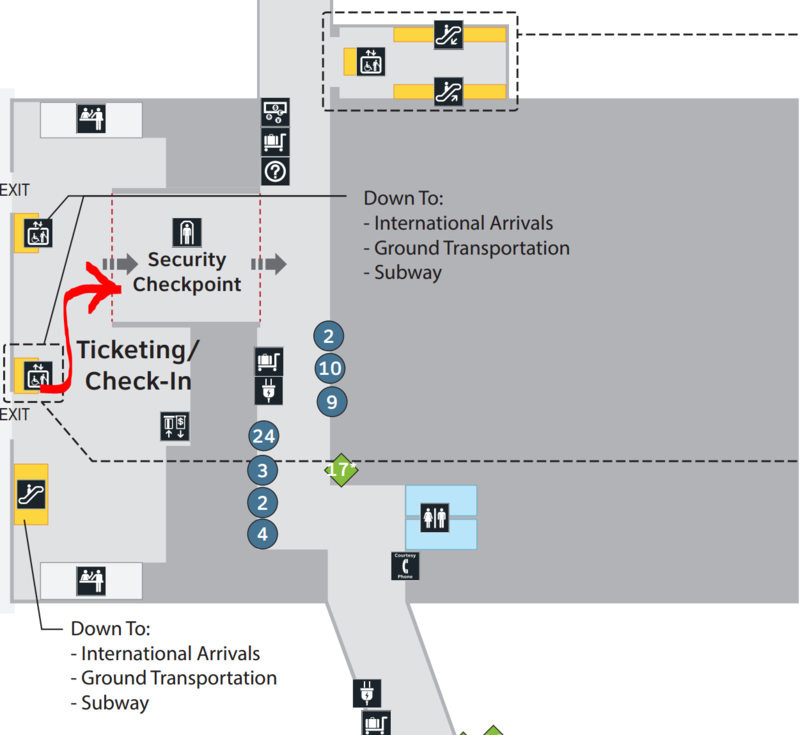 Similarly, C North (C14-C27) are directly connected to the D terminal, though the Skyway is not really out of the way and is useful if going from a low C gate to a high D gate (C24 to D10, for example). Terminal A and Terminal B are not connected by any walkways, and you must use the Skyway to change to or from these terminals. For international arrivals: after clearing customs, stay to the left of the baggage re-check belts and follow signs to exit to arrivals (like you're going to curbside). Once in the arrivals lobby, take the elevator or escalator up one floor to find a PreCheck checkpoint and a usually-less-crowded regular checkpoint. If you ignore this advice and proceed up the escalator behind the baggage re-check area, the transit security checkpoint there is often congested and does not have a separate PreCheck checkpoint. The marked elevator will spit you out literally directly in front of the PreCheck checkpoint. There are lots of exceptions, though, and some specific flights have as low as a 35-minute MCT, which is doable as mentioned above. IAH is a very efficiently designed airport, and you should not worry about what appears to be an abnormally low connection time; if UA says your connection is valid, it is almost certainly doable within the allotted time (notwithstanding delays, of course, and standard advice regarding allowing longer connections for mission-critical travel or travel on separate tickets still stands). Don't recall anyone posting about that. The second flight is domestic -- the bag will come ut at the carousel in the customs arrival hall after the international arrival. No subsequent flights are going to be considered. I have a 45 minute connection at IAH but looks like I will have to go from C7 to E15. Yes. It’s tight but doable. I’d try and sit as close to the front of the arriving aircraft as you can. Can it be done? Sure. UA wouldn't sell it otherwise. It meets the minimum connect time. But a lot of people would say it doesn't meet the minimal sensible time. What's your final destination? Are you okay with missing the flight for whatever reason? Just remember that the door is supposed to close 10 minutes before departure for domestic departures, so 45 minutes is really 35. I think you can. Keep in mind either or both of those gate assignments could change three times between now and actual. It's a 787-900 Sfo to Iah, I'm in the second row of Y. Second flight is to Lga. I'm traveling very lightly, anticipating having to run. I've been following the flights for the past week. One time the first flight came into the E gates, but mostly C.
I'm in FC on a mileage upgrade for the LGA flight. If I miss that one due to bad connection, and they don't upgrade me on the next (and last) flight to LGA, I'll ask for he miles back. Would I qualify for downgrade compensation also? GG OVS DOWNGRADE? It's doable but it is certainly a fairly long way from C7 to E15. And I have had some very long taxis at IAH that have turned 45 minute connections to 30 minute connections. Be ready to run/walk very fast, but most days you would make it. Just remember that the door is supposed to close 10 minutes before departure for domestic departures, so 45 minutes is really 35. C7 to E15 is nearly the worst case C to E transit. The United App gives a 21 minute travel time and suggests making use of SkyTrain. If OP were to run, it's likely possible to shave a couple of minutes off of that, and the train isn't a requirement; it's faster to take the train if it happens to be departing just as one arrives, but if there's much of a wait for the next train, it's likely faster to run. If F is full on the next flight, your choices are to wait for a flight in F or take the next flight in Y. If your upgrade clears on SFO-IAH, you wouldn't technically be due any miles for IAH-LGA not clearing. You would not qualify for downgrade compensation; the F cabin isn't oversold. The risk tolerance question to OP is what the consequences are of a misconnect. There are eight nonstops a day IAH-LGA and an additional five to EWR. Thus, likely that if OP misconnects, he will find something. But, if there is a mission critical event on the other end, this is not a connection I would book, given that there are five nonstops/day SFO-IAH, not to mention six nonstops SFO-EWR. I book these sorts of connections, but I also understand that there is a risk. Be particularly attentive to the note above from jsloan regarding the T-15 gate deadline. While UA may not offload until T-10 or even later, if the flight is ready to go at T-15, it's unlikely to sit there. In addition, if the flight is overbooked and there is an oversale, UA will offload at T-15 to avoid paying IDB/VDB. I went C1 to E17 on Saturday with a 0:58 connection. Was in the front row of Y on a 737. Took the train, walked briskly, got to E17 in the middle of Group 1 boarding for an intl flight. I've done the opposite before, E to C North with a 36 minute connection to the last IAH-LGA of the day. Inbound flight arrived 15 minutes early and made it with plenty of time to spare. I've yet to see these doom and gloom scenarios around T-15 play out. Just last week I was on a flight leaving DEN where the last passenger on was at T+2. They knew she was coming off a late inbound and we waited until she was on board before closing the door. I'm hoping for an early arrival into IAH. I don't go through there often so I'm not that familiar. I did not realize there is a train between C and E.
Do I have to go to an upper level to catch it? UA will sometimes hold a flight, but you can't count on them doing so, and you have no recourse if they don't. And they definitely aren't going to hold a first class seat -- they will absolutely have upgraded someone into OP's seat at T-15 (assuming the outbound is departing on-time). I see that all the time; I've actually gotten someone's F seat when they arrived at about T-12 and I'd already been upgraded into it. They do happen. And, as mentioned, they will offload passengers, if necessary, to avoid paying VDB -- although I did have one wonderful gate agent at DEN have me wait until the last possible moment to board as the #1 volunteer while they waited for a late connecting family. His rationale was, "I'd rather have a volunteer spend the night in Denver than have someone forced to do it." The family didn't make it -- we assumed they gave up when they saw how late their flight had arrived -- but it was a great gesture. Yes. The train is upstairs, airside, and runs every few minutes. There is a single, consolidated stop for D/E that arrives fairly close to E15. Yes, the skytrain is one level above the gates on the north side.